Which is Better, One or Two Front Doors? 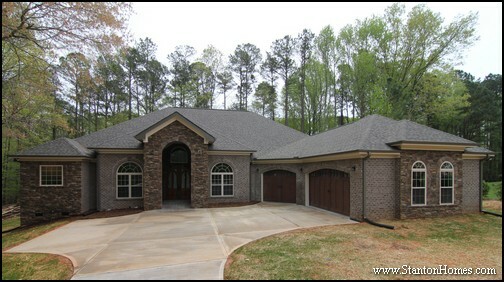 Interested in two front door homes? Two front doors serve aesthetic and practical needs. On one hand, two front doors craft a symmetrical entry to your home and offer extra ease-of-movement during social gatherings. 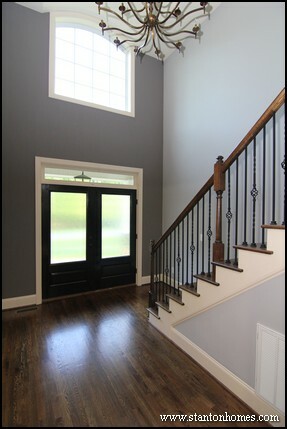 One the other hand, two front doors require additional entry wall space and a wider foyer. Take a look at these top 5 two front door designs - with exterior and interior photos - to get North Carolina new home building ideas. 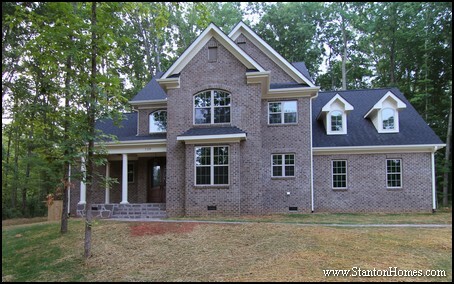 This Raleigh custom home - a version of the Avonstone Manor floor plan - features two front doors made of steel with raised panel designs above 3/4 curved glass fronts. Rounded windows, openings, and stairs mirror the curved door design - and they enhance the symmetrical feel of this impressive front entry. 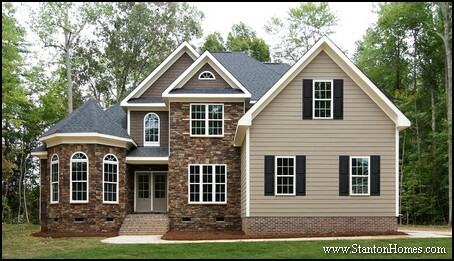 Front doors with a dark color are a classic choice for North Carolina new homes. A medley of classic Craftsman touches punctuate the exterior of this Raleigh custom home - a version of the Shoal Creek - like the white porch columns with stone bases. These two front doors are 3' x 7' with a 3/4 glass front. The chord style glass lends privacy to your foyer. A rectangular clear glass transom window spans above the two front doors. And a large arched picture window opens up the two story room. The dark door stain - in "English Walnut" - flatters the "Nightingale" painted walls (from the Benjamin Moore Affinity Collection). On move-in day, you're going to love the extra width a second front door provides. 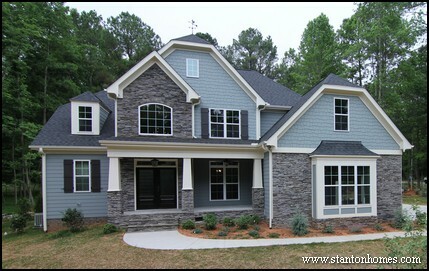 Cypress Weather Ledge stone wraps around these double front doors, on this version of the Lowery. A portico style overhang offers shelter when entering your front door. These two front doors feature a six-panel glass design. If you love a two front door floor plan, but want a more slender entry width, consider foregoing sidelights (windows on either side of the front doors). 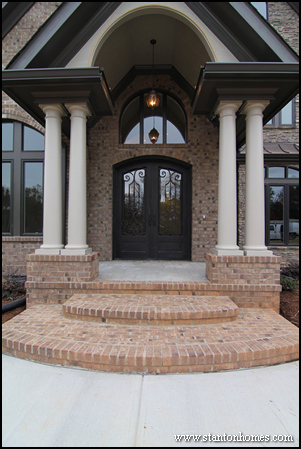 Flagstone steps lead to an elegant and traditional front porch with white columns and double arched front door entry. 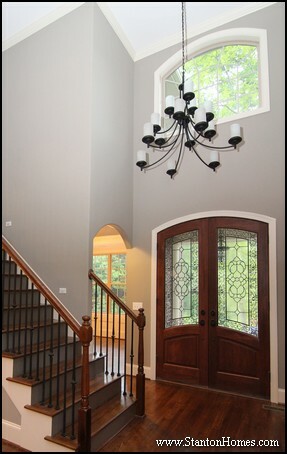 These front doors are solid Mahogany, from the Aberdeen Lake Norman collection. Intricate details in the glass reflect natural sun from outside and faux candle light from inside. Can I include two front doors on a home with a one story foyer? Two front door entries are often paired with two story foyers, which are more suited to shape and size of double front doors. These front doors hint at an Old World rustic home design, gone modern. These two front doors form a massive arched opening - stretching the feel of the 8 foot tall design. 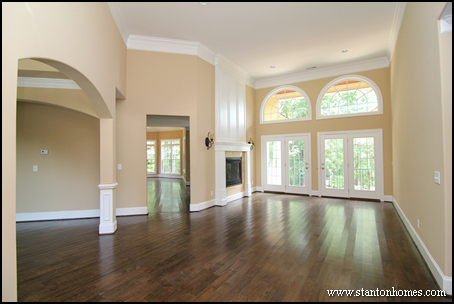 A one story living room and dining room rest on each side of the raised ceiling foyer. 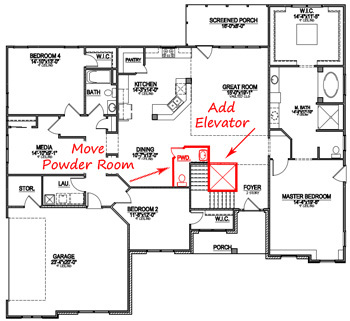 With a floor plan like the Judson, you can limit the spread of your foyer without sacrificing first impressions. 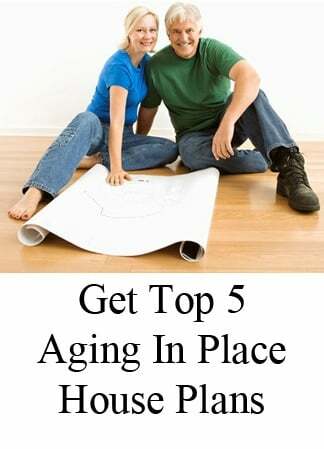 Is Your Home Ready for Multigenerational Living? 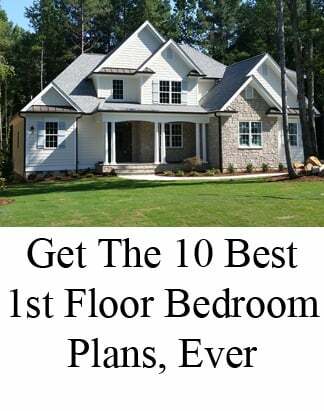 Aviod the top ten mistakes that home buyers make - get the inside scoop on how to build a new home in North Carolina that will make you feel good. No matter how nice a model looks, be sure your builder backs up the work that will go into your new home with an extensive warranty. Ask what it includes, and see how long it lasts. If you've already bought your lot, choose a builder who can fit your plan to your lot - or create something new that will have all the elements you're looking for. Building envelopes can be elusive when you're just eyeballing property, so make sure to get a fully involved inspection that will provide important aspects you need to consider. It will help you know what to watch out for - and what everything will cost. If you haven't bought your lot yet, be sure the builder has the kind of insights that will make his perspective valuable to you. Walk the lot with him, and see how much information he provides. A builder's on-site perspective can save you a lot of headaches (and money) later. 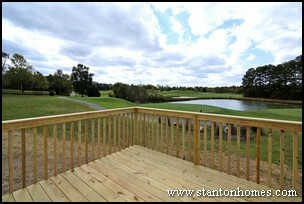 Stanton Homes provides the most extensive, fully-involved, research-backed, walk-around-it-in person lot inspection in the Triangle region. Find out the difference that makes as you ponder all the possibilities together with the builder. Don't sign up before meeting the team you'll be working with throughout the construction of your new home. Meet the builder. Talk to him. Find out how much he really knows, and how much you'll be able to talk with him directly, as your home is being built. 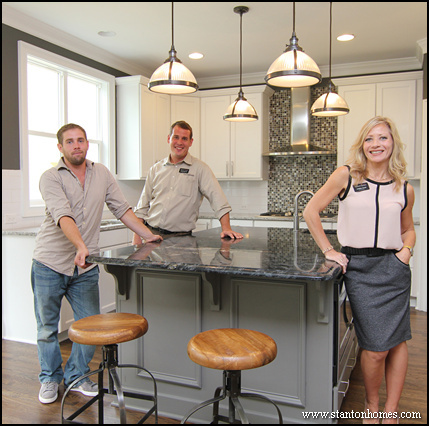 And then check out the rest of the team that will be working with you to create your custom home. Your project manager will be taking care of every little detail, so make sure you're comfortable with their expertise and availability. Meet the interior designer who will be helping you make your selections - see how approachable and creative they are, and determine how much they can help you make great choices. Choose the team that understands what you want to accomplish and can make that happen - and will make the process fun and exciting, from design to craftsmanship - with compelling concepts, quality materials, the latest technologies and energy savings. 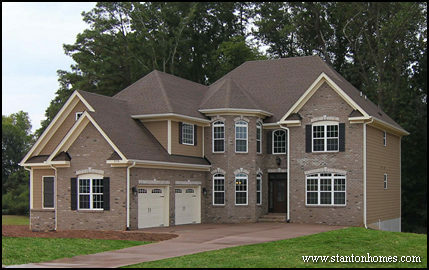 At Stanton Homes, our family designs and builds custom homes for your family, with the kind of personal attention that compelled Professional Builder Magazine to designate Stanton Homes as one of the nation’s top builders. 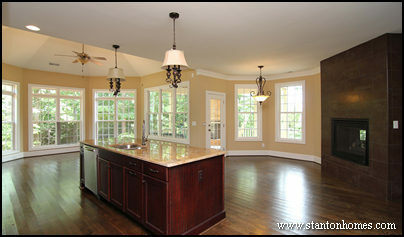 Just because a builder says they add some trey ceilings does not mean the results will look the way you envision. Take a close look at the details, so you can determine what kind of craftsmanship to expect in your new home. 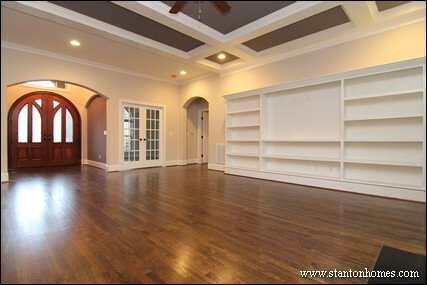 Look at trey ceilings, barrel vaults, archways, built-ins and other features in photos of new homes. 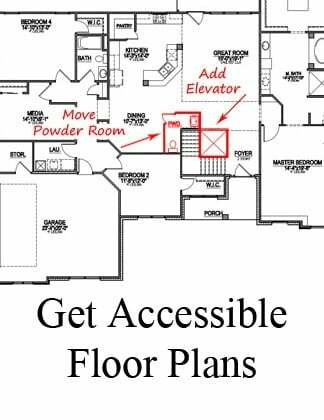 Ask the builder what comes included and what's an "upgrade" in the floor plans you're considering. If a builder's standards start with square walls, square ceilings, and square footage - and everything else costs extra - you might want to take a closer look at the craftsmanship and quality of everything from materials to detail work. 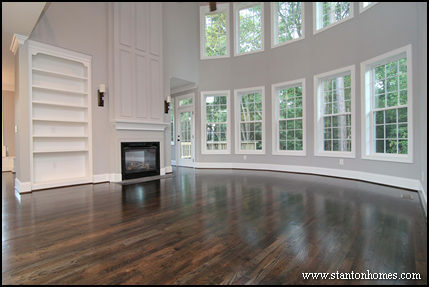 If you're building a custom home, you should be able to choose a floor plan that isn't like everybody elses. If the builder you're talking to has price sheets, for example, that probably means he's a production builder. Because it's easy to give instant prices when all homes you build are exactly the same. If you want something personal, you'll want to make sure your builder can work with plans from any architect - and has an on-staff design team to make modifications to plans or create something new, just for you. 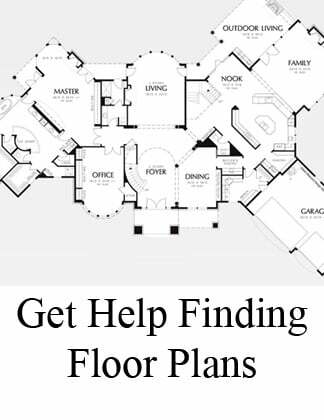 Once you've got the floor plan right, the next thing to consider are all your selections. Make sure your builder offers the services of an interior designer who is there with you throughout the process, helping you make choices at a level of interaction that is comfortable to you. If you'd like to do it all yourself, there should be extensive showrooms that you can browse. If you want a professional designer to make everything come together for you, that should be another option. If your builder does offer designer services, ask how much time you'll have to rely on the opinions of experts. Ask if all you'll get is an initial consultation, or whether there are plenty of times to work with the designer throughout the entire building process. You should be able to choose your level of involvement in the design process, and get the amount of help from the interior designer that you need. Just because a builder says there's energy efficiency doesn't necessarily mean you're getting the most you can. There can be a big difference in what goes into your walls, so be sure your builder will talk frankly about energy savings options. Make sure your builder shows confidence in your energy savings through third party inspections, that further ensure how healthy your new home energy efficiency will be for you, with HERS scores that assure your comfort and savings. Make sure the builder uses quality materials. Look at what the builder considers to be "basic level" materials. It can tell you a lot about the kind of quality you can expect throughout your home. Consider the materials before you get excited about a price that seems a little low. And find out what it costs to get the quality materials that would make you feel comfortable. It's one of the biggest mistakes homeowners make when they compare prices - leaving out the comparison of quality materials in everything from carpet to appliances, tile, granite and every other aspect of your new home. All the latest ideas are all over the Internet. Check it out! Some builders don't offer ANY access to the people who are building your home. They tell you to choose one of their plans, pick a carpet color, and decide between a couple of tile selections. You don't really need to be in contact with the builder or his team if that's the kind of home you want to live in, because there's nothing else to talk about - they just send out a crew to slap up your home and the other ten on the block. If you want a CUSTOM home, be sure you have the opportunity to talk about what is happening and find out what comes next - from the first time you talk to the builder until you have the key in your hand to move in. The best builders offer access to the builder, your project manager, your designer, and an online source of information that is personalized for you.